: 7QT - geesh, I'm done with today. 7QT - geesh, I'm done with today. 1 - Falshed Junk Mind by Milky Chance. I like their stuff. 2 - Today I got out of bed a little after 5am so I could get a head start on the day. Within fifteen minutes two of my kids were walking down the hall. Fifteen minutes later four of them were up. The day pretty much went downhill from there. Not that anything really went wrong, well, until L's thumb got smashed by a landscaping rock and we had to take her to a prompt care (not broken). But all day it just felt like I was losing; I was actually looking forward to the "Game Over." 3 - When L's thumb got smashed she was in intense pain - the worst of her life she kept telling me. However, in the midst of her really incredible pain she kept saying really sweet, cute things. Talking to her thumb she sobbed, "I love you but why do you have to hurt so badly?" After I asked her if she'd rather Daddy or I stay with her at the prompt care she replied, "I'd like Daddy to stay with me. If that's okay with you." And my favorite: Trying to get her mind of the pain so she could calm down she said, "I'm going to think about rainbows." Seven years ago I did not have a favorable opinion of Catholic schools. In my experience, the vast majority of Catholic school families were rich snobs who cared more about a hoity-toity private education than vibrantly living out an orthodox faith. My experience with several Catholic schools in my area has changed that perception, though, especially my experience with the parish school my children now attend. But our school is amazing and we are very, very fortunate to belong to the parish and school community. If, for any reason, you want to hear more about why we send our kids to Catholic school please feel free to ask. Or you can read all of Kathryn's good posts on it. 5 - JP is 18 months and he is really, incredibly trying. Exhausting. Future JP, if you are reading this, I love you buddy, but oi vey! If you follow me on Instagram on Facebook then you know that he climbs onto the counters and gets into the cookie jar. He climbs into his booster seat and buckles himself in and then cries because he can't get out. He opens the garage door and wanders around, in his bare feet, sometimes pushing the swivel sweeper. I've caught him swivel sweeping the driveway when it was 36 degrees outside. He reaches up to the counter and pulls down raw chicken, milk, knives, eggs, dirty dishes... AND he's still waking up at night! 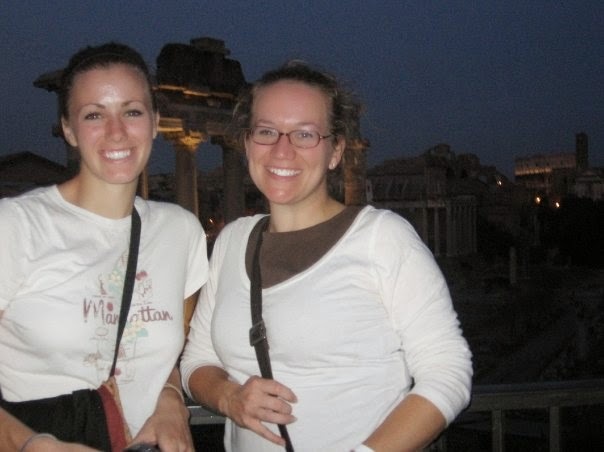 6 - I know there are a lot of worthy people and places to tithe to, but if you have an extra $5, or $250, to give away please consider giving to my friend Emily who is hoping to be trained as a Creighton instructor. Thank you! 7 - When you watch the Super Bowl commercials this weekend pay attention to the pretty blonde playing the wife and mother in the Nissan commercial. She's my friend, Jolene. Rome. I brought her on a pilgrimage with me even though she was a non practicing Presbyterian. It was the best. Thank you, Kelly, for hosting! I just heard that song today, and I love Stolen Dance! I still can't get over the fact that they are German! And oh my gosh the story about the thumb made my day, how sweet :). Ugh. I'll never understand the mommy wars phenomenon. Let's just support each other! Sorry you had a rough day. I think I was right where you were when we initially started Catholic schools - funny, how the Holy Spirit puts an awesome one in your path. Ugh, I detest days that start out with an early wake up call from the kids. You can just never get ahead of the funk. Love you, Bonnie! "I'm going to think about rainbows!" How sweet that she was trying so hard to be brave! And ouch! Finger and thumb injuries always hurt so much with all those nerves! I'm so sorry about Lydia's thumb. 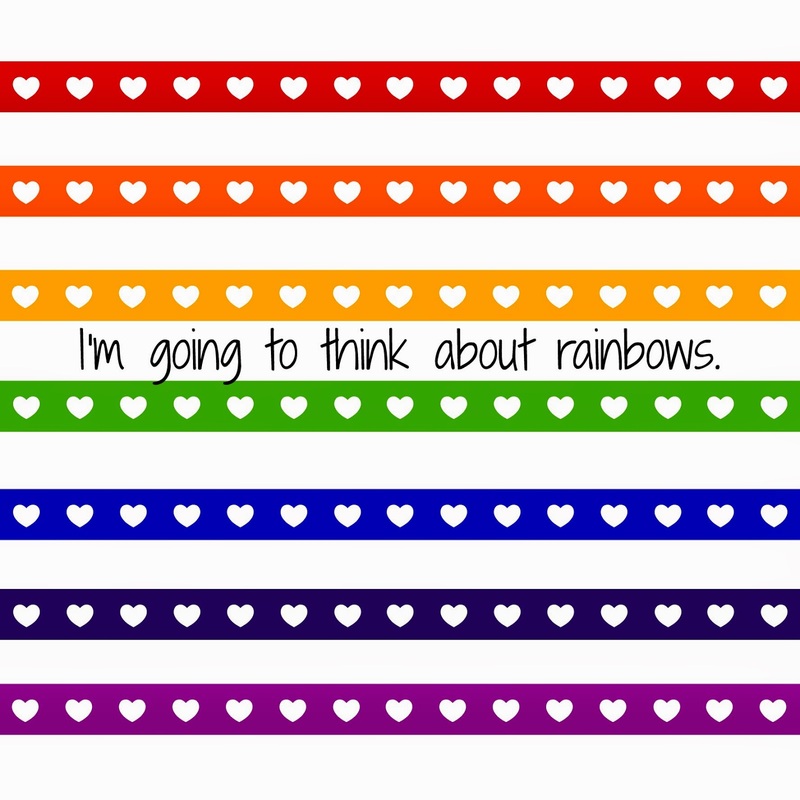 That is the sweetest thing that she thought of rainbows and I love your sweet graphic. I'm so glad you have been blessed with a great Catholic school! And that's really cool about your friend being in the SB Nissan commercial! I saw the short clip and it looks like a great ad to be a part of! PS: my 18 mo. daughter is a little monkey too! Into everything, all the time :/ Such a challenging age! This too shall pass! Okay, I know this funk and not getting ahead of the day funk feeling you speak of. Poor sweet, Lydia was way more graceful than I would have been! Lol praying tmw is better! My 17 month old is a crazy climber too. And he pulls things off the counter, so your quick take is making me feel a little less overwhelmed. I love your taste in music Bonnie, just love it! I haven't even listened to the song yet but I know it's good. Your Joseph sounds like my Gavin. I gave up stopping him from doing stupid things and instead teach him to do stupid things safely. Like intentionally throwing the ball into the street and making him look both ways before getting it, or how to safely set up a ladder to get his toys down from the roof. The good news is, he's still alive at 5.5, but I've got a lot more gray hair these days.